Refugee4Refugees has been involved in hundreds of humanitarian missions on the island of Lesvos. Here are some examples of Omar and the team at work. Boat landing in Skala Sikamineas. The aftermath of a fire we responded to in July 2017 at Moria Camp. Assisting refugees arriving in Skala Sikamineas port in winter. Omar Alshakal explains what motivates him to help fellow refugees. Filmed at Lesvos' lifejacket dumping ground near the village of Eftalou. 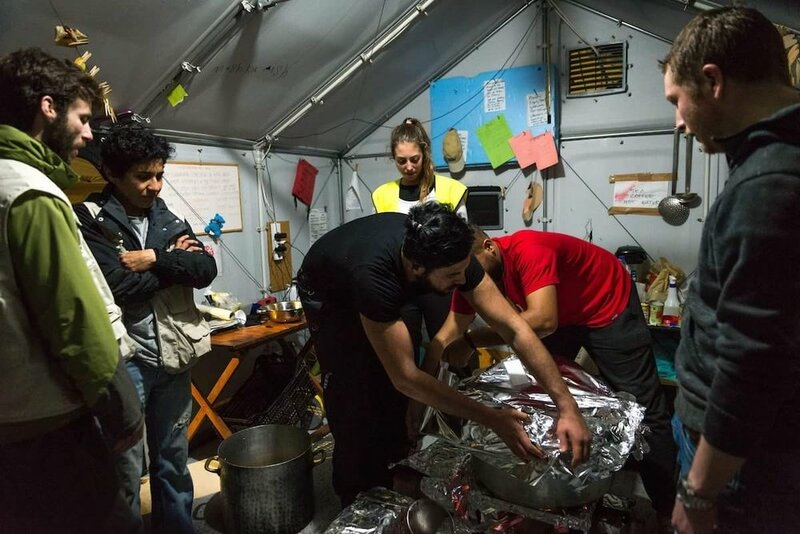 Cooking for refugees in Stage 2 camp. An Afghan child drinks juice after arriving on the northern shores of Lesvos on 12 July 2017. Refugee4Refugees responds to a landing at Korakas, a lighthouse on the northern shores of Lesvos. Volunteer spotters alerted Refugee4Refugees and other independent NGO's that a smuggler's boat had landed near the lighthouse on the island. Volunteers responded and 24 Afghan refugees were rescued and transported to a UNHCR camp. An Afghan toddler is comforted by her father upon arrival to Kaiga Beach on 12 July 2017. Omar checks the perimeter of Moria Camp after a fire in an olive grove outside the fence in June 2017. Omar Alshakal works with NGO's Proactiva and Lighthouse Relief to relocate refugees stranded on rocks on Lesvos. Refugee4Refugees Founder Omar Alshakal is on a NGO search and rescue vessel between Turkey and Greece. He explains what happens during water trainings and protocol if they spot a smuggler's boat carrying refugees. Omar comforts a young girl who had recently landed by boat on Lesvos. One of our favourite projects was donating clothing to Syrian children in Turkey in April 2017.